Swap your beer can for a Bundt pan for an easy, tasty meal! One day while attempting to reorganize my kitchen cupboards, I discovered that I had 5 different tube pans. Some with straight sides (great for angel food cake); some with fluted sides (for Bundt cake). 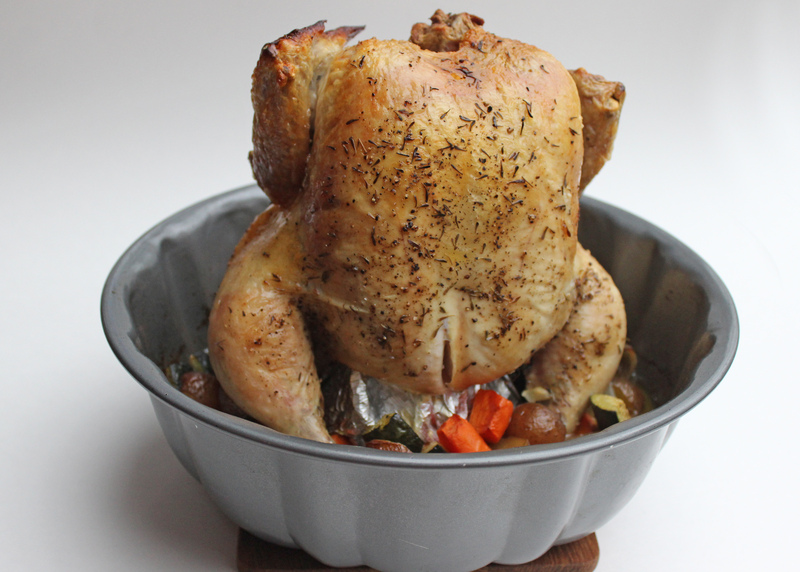 This discovery got me to thinking….”what else could I do with a tube pan?” My very next thought was, “hey, why don’t I use one of these to roast a chicken?” These metal baking pans with central cones make for a much easier and more successful twist on the popular “beer can” chicken roasting method. The first big benefit? You don’t need to wrassle that hot bird off a can filled with scalding liquid when it’s time to serve it up. The second huge bonus? 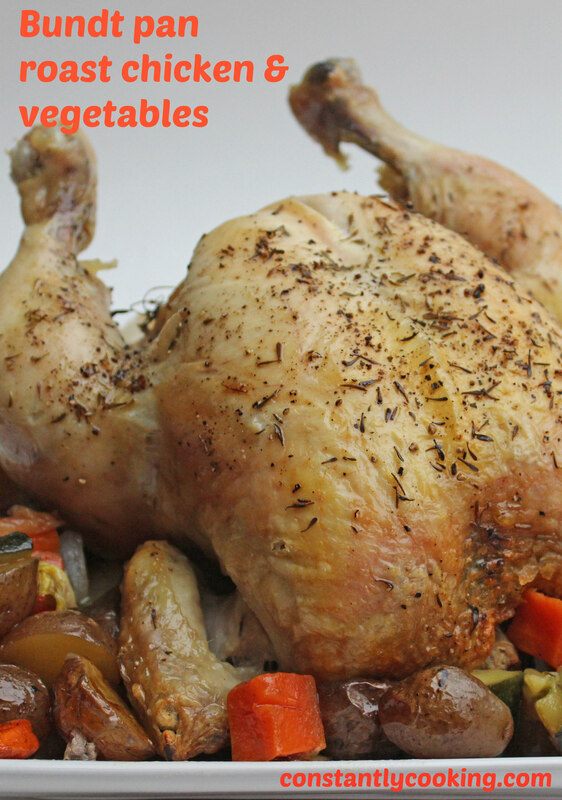 The vegetables in the bottom of the pan happily roast away, basted automatically by the chicken’s delicious juices. 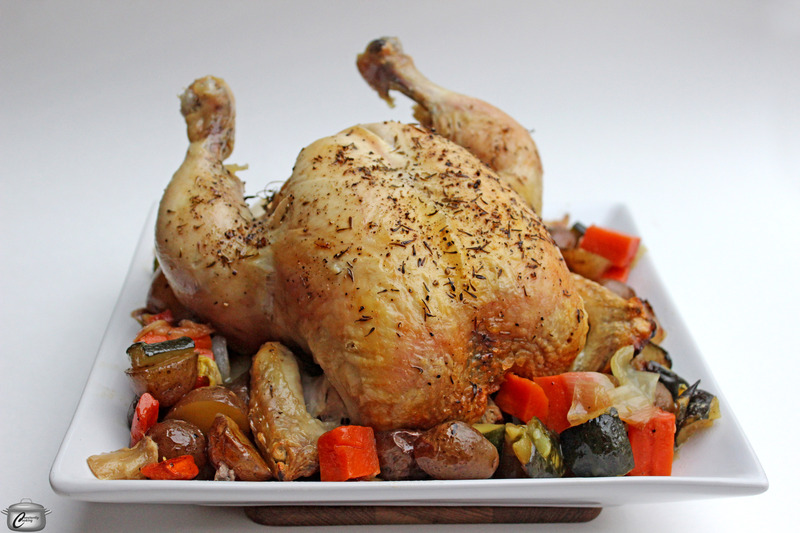 At our house, we call it Sunday Chicken after the scrumptious roasted delights we’ve enjoyed at Parisian farmers’ markets; if you like, you can simply call it Better than Beer Can Chicken. Remove your oven’s middle rack (and upper, if you have three racks) and preheat oven to 425F. 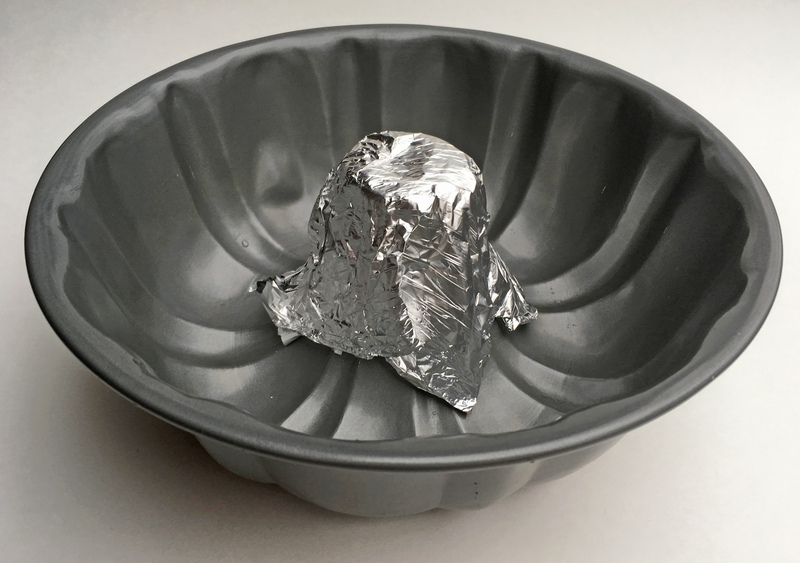 Cover the central hole of the Bundt or tube pan with heavy duty foil. Drizzle a little olive oil in the bottom of the pan and use a pastry brush or your fingertips to spread it around. Scatter the vegetables into the Bundt pan, then drizzle with a little more olive oil and season with salt and pepper. With a spoon or your fingers, toss the vegetables to coat evenly with oil, then scatter several sprigs of fresh thyme on top of the vegetables. Rinse chicken, removing gizzards and/or neck from the cavity. Pat chicken dry with paper towels. Rub olive oil all over the skin of the chicken, then season generously with salt and pepper plus dried or fresh thyme leaves. Put the lemon half and a few sprigs of thyme inside the chicken’s cavity then place the chicken over the ‘post’ or covered hole of the Bundt pan. Put pan in preheated oven and after 30 minutes, drizzle the chicken stock over the vegetables. 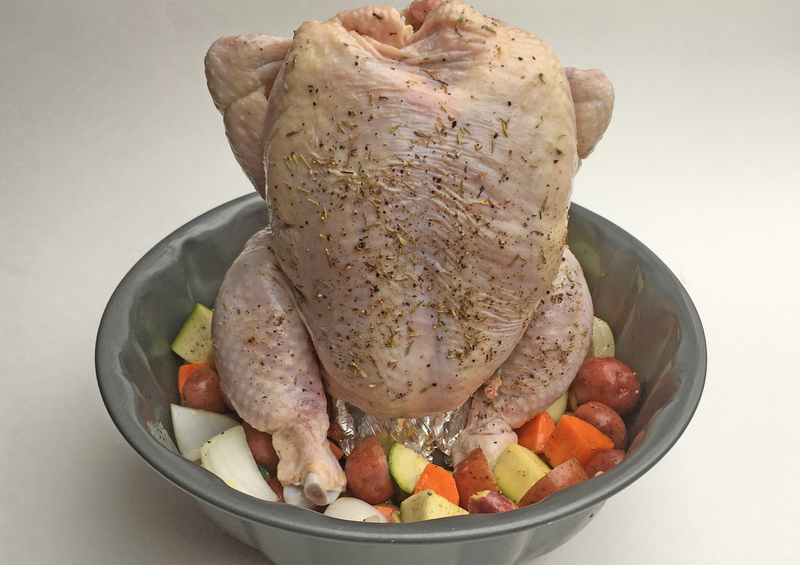 Bake until the chicken is cooked through (165F in the thickest part of the breast) and skin is golden, about 1 to 1 ½ hours, depending upon the size of the chicken. Remove from oven and let rest for 10 minutes before carving. Remove roasted vegetables to a serving platter and pour pan juices into a jug to pass at the table. Slice chicken and serve. 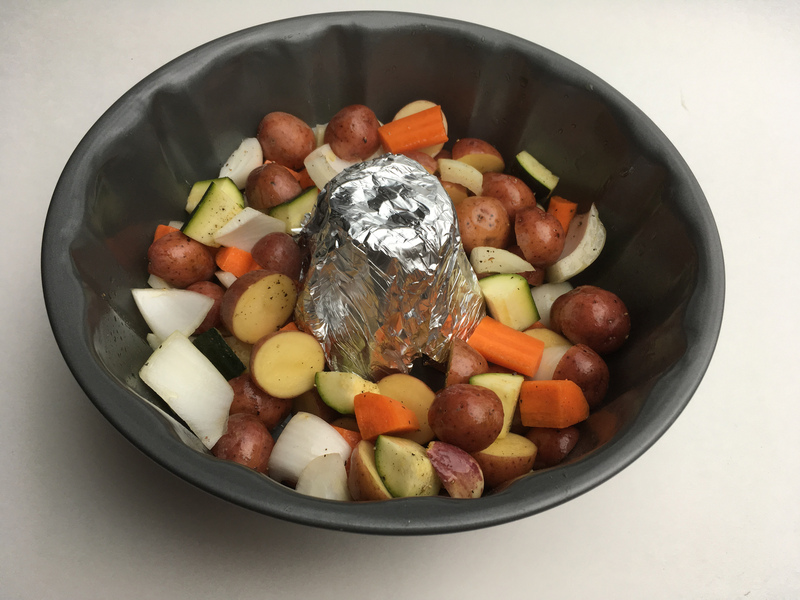 This entry was posted in Chicken, dinner and tagged beer can chicken, best ever roast chicken, better than beer can chicken, Bundt pan chicken, carrots, chicken, chicken and gravy, how to roast a chicken on a tube pan, onions, Paula Roy, potatoes, roast chicken, roast vegetables, tube pan chicken, zucchini. Bookmark the permalink.